Almost all of my memories in life have a food link. Taste ripples beneath the surface of my history. Is that weird? My husband thinks it’s totally weird. He can mention somewhere we went 5 years ago and I’ll be able to tell him that I ate slow cooked ribs, dripping in sticky, smokey sauce or that he ordered steak but it wasn’t quite rare enough. I’ll talk about that time we ate coffee and walnut cake, overlooking those amazing gardens, you know, the ones with the maze. I’ll remember the picnic we ate on the lawn in South Africa and the dark chocolate ice-cream at our wedding. I have very distinct memories about brunch. They are all from trips to America. Any light, bright, fresh brunch takes me to another time and place there. It makes me think of California sunshine and New England mornings. The Americans do brunch so well don’t they? So, the sun was shining here this morning and I decided to take breakfast up a notch from our usual Cheerios flung across the table. I put this little meal together and enjoyed my foodie daydreams. 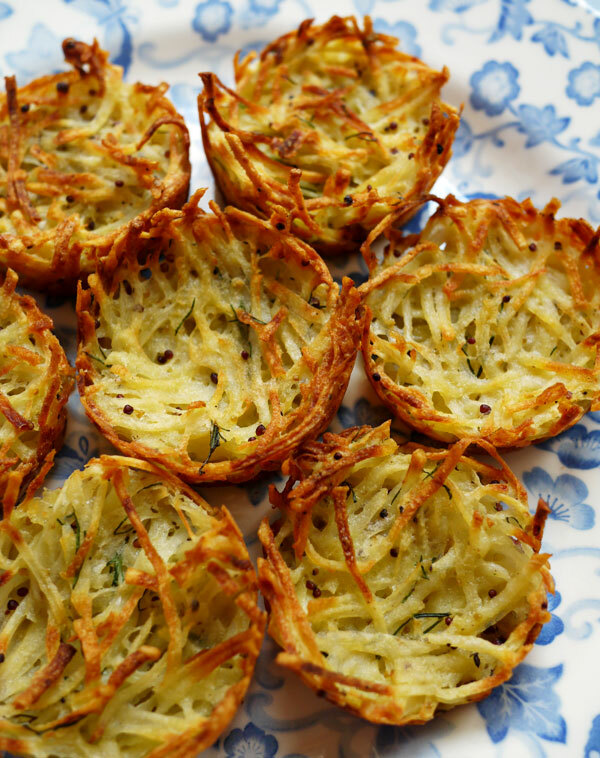 These little oven baked rosti, hash brown type things are really something special. Simple but so effective. 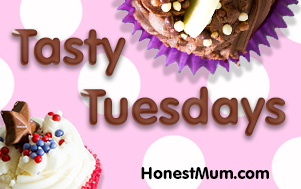 G&H loved them, they are crunchy and feel a bit naughty = perfect toddler food. They’d also made really impressive chunky canapes, topped with little pieces of salmon and dressing. You could make extra and freeze them, crisping them in the oven after defrosting. 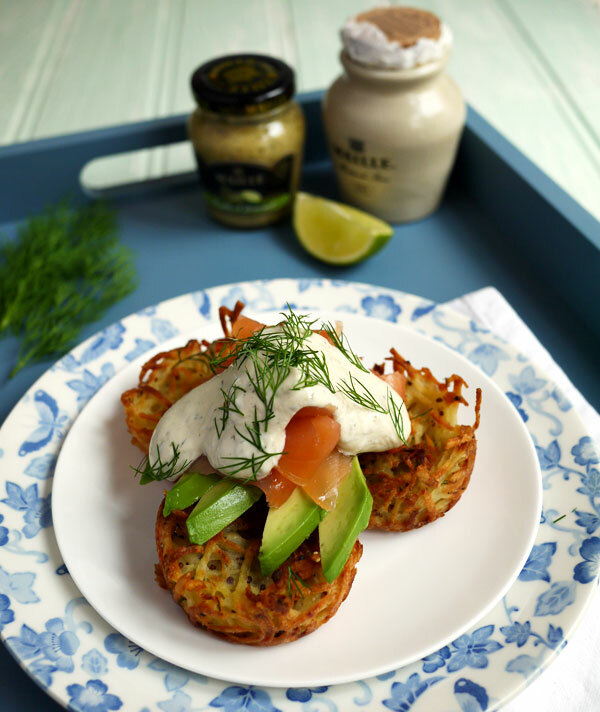 I have to say, the big hunk of butter that goes into these rosti makes my heart ache a bit. But I’ve tried it without and sadly they don’t quite crisp as much. You could omit the butter and use an oil spray to spray the pan, they will just be a little bit more tricky to get out and not quite as golden and luscious. 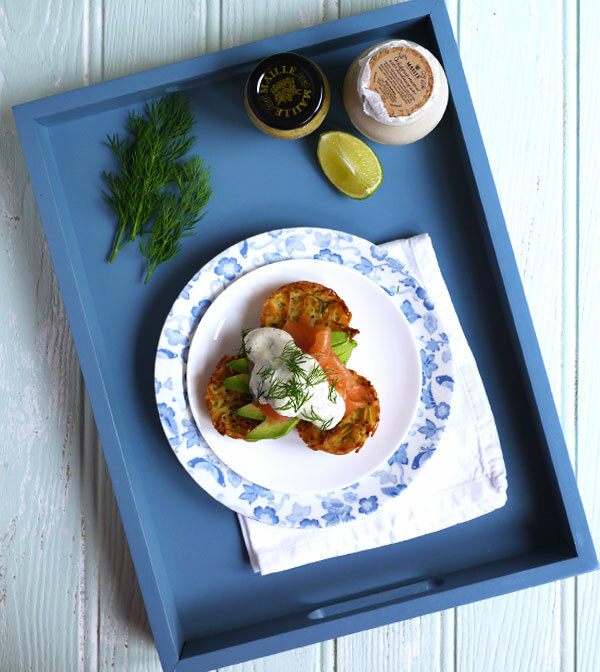 In this recipe I used this Mustard with White Wine, Dill and Lime and also this Wholegrain Mustard with Chardonnay. Squeeze all of the liquid from the potatoes. You can do this by squishing piles of it between your hands, or squashing down into a sieve. The way I do it is to pile it all into a clean muslin cloth, twist it together into a ball and press the liquid out. Brush 2 muffin trays (24 holes) with the melted butter and pour the rest into the potato mixture and stir. Stir together the dill/lime mustard and the greek yoghurt. Set aside. 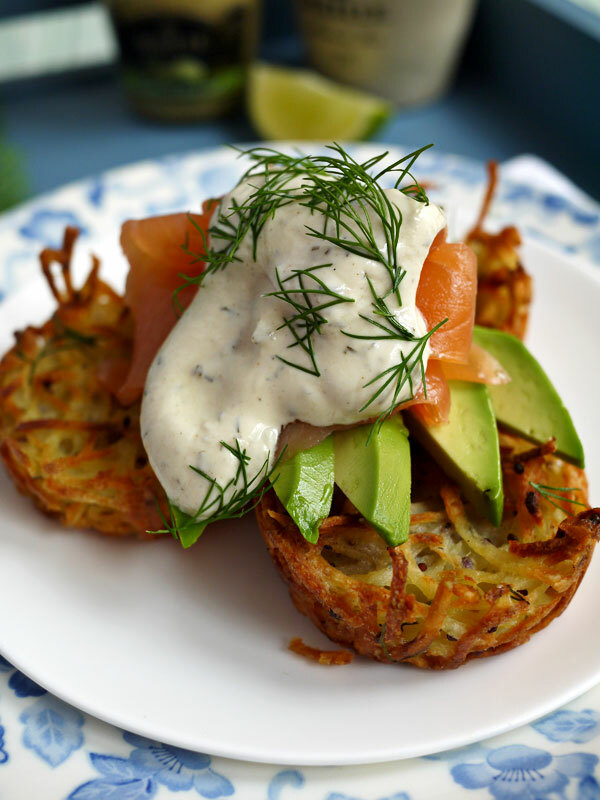 When the rosti are cooked, allow them to stand for 5 minutes, before loosening the edges with a round ended knife and 'popping' them out. 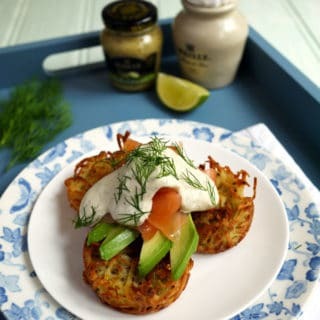 Top with slices avocado, a squeeze of lime, followed by smoked salmon and the yoghurt dressing. Sprinkle with fresh dill. What’s your perfect brunch? What are your favourite foodie memories? Mustard, love it or hate it? PS. 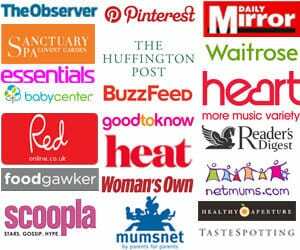 I have been shortlisted for these whopping great big BiB awards, in the Food category. If this recipe made your mouth water, please can I trouble you to vote for me? It takes 2 minutes and it would make my day. Thanks so much! PPS. This is my entry into the Maille Mustard Culinary Challenge. You can see more of the entries on Twitter, using the hashtag #Mailleflavours. Please move in with me? Please? That does actually look to die for! 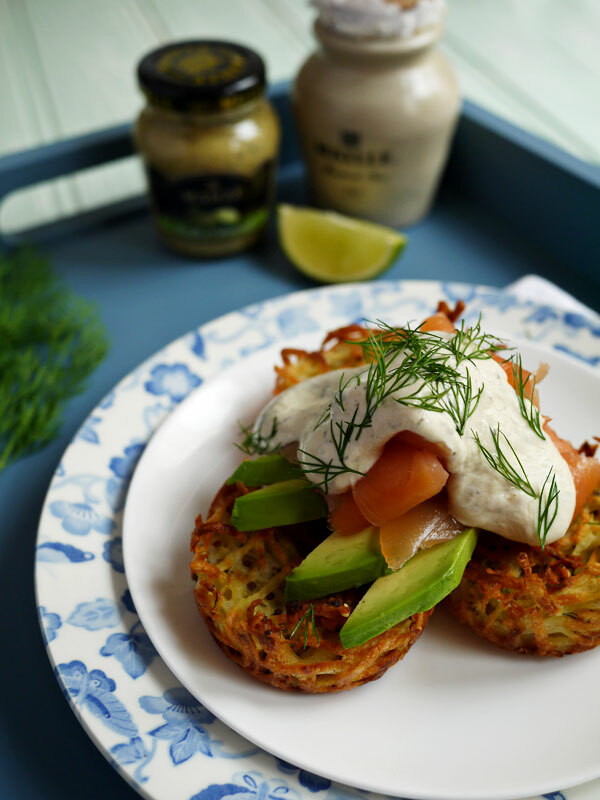 I love rosti a ridiculous amount, and I love the combination with the smoked salmon here. Pinning it for later. I’m going to try this but was thinking; could you turn the cake tin over and mould them around what should be the bottom and then you won’t have to get them out (trying to use less butter). I know they won’t be as crispy but maybe worth a go!